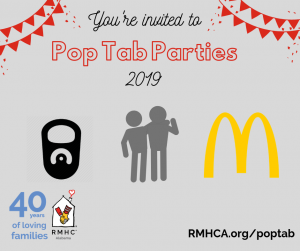 Ronald McDonald House is more than just a place to lay your head. 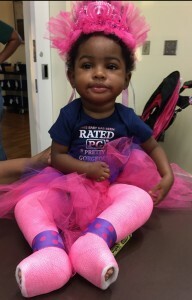 Farriah “FeFe” was born with club feet, club hands and a dislocated knee, but also the cutest smile you will ever see. In her life of just a year and a half, Farriah’s family has stayed at the Ronald McDonald House in Birmingham about ten times and they expect that number to grow as there are still surgeries, treatments and therapies in their future. The ultimate goal is to get this little one walking, but after three surgeries, multiple castings and a lot of therapy, that goal is still just that – a goal. Farriah’s family has been thankful for RMHCA for many reasons. Of course staying closer to her doctor and therapist is important to them, but her family also tells us that being around other kids who are going through something similar has been good for them. Being around others with similar problems reduces the feelings of being alone and unlucky that often haunt the families and children who stay with us. And of course there are the special bonds that form among patients and between patients and RMHCA staff that just happen when people are touched by a spark they see in someone else’s smile. During Farriah’s stay, she has become close to one of the RMHCA staff members who has helped her through her journey tremendously. We have been told that April, our Family Services Manager has helped FeFe make more improvements than any of the therapists or doctors. April has a special touch and extra love that has helped Farriah out time and time again. FeFe is all smiles when working in April’s office — it could be picking up pencils and handing them to April (watch video below!) or reaching high for a toy, but she works harder for April than she will for anyone else. “April just makes you feel loved and that is what Farriah needs the most right now,” shares Farriah’s mom. We all know how much a person’s attitude and optimism contribute to the health of that person. RMHCA is very fortunate to have staff members like April who connect in ways that only they can with patients like FeFe. April is giving FeFe a gift that only she can give – and for that we are all thankful.